Who was Saint George? Watch this story, one of our ‘British tales’ videos about characters and people from British history, to find out. Who was Saint George? Watch this story, one of our ‘British tales’ videos about characters and people from British history, to find out! Tell me about your last vacation. Where did you go? What did you do? What did you do for you last birthday? What did you eat for you last meal? Who did you meet last week? What did you do together? Tell me about what you did for the last 24 hours. When was the last time you were really excited about something? Tell me about where you lived as a child. When was the last time you went to an amusement park? How was it? What was the best meal you ate recently? When was the last time you went to a movie theater? What did you see? Talk about the last time you were really scared. Tell me about your best or worst school teacher. What tech problems annoyed you recently? What was your first TV like? What are some events in the past that made you who you are? What did your bedroom look like when you were a teenager? When was the last time you were shocked? What chores did you have to do when you were young? Where did you hang out with your friends last? What did you do? Who were some of your favorite sports stars in the past? Why were they your favorite? Name some of your country’s famous sports stars of the past. What games did you like to play when you were a child? 1. I ________ in Canberra last spring and this yearI__________ in Rome.2. We _________ at school last Saturday and thisSunday we ___________ at home.3. Tina ______ at home yesterday, she ________ atwork.4. You ________ very busy on Friday, _________ you busy today?5. Jessica and Kimberly _________ late for school yesterday, in fact, they _________ always late.6. We _______ students in 1990, now we ________ teachers.7. He _________ in a hurry because there __________ a lot of traffic.8. Last night you ________ angry because yourgirlfriend __________ at home.9. My father ___________ at work yesterday becausehe ___________ on vacation.10. Trixi and Felix ______my cats, they died 5 yearsago.11. Susan and Betty __________ good friends whenthey ____________ at school.12. They _________ good at sports but they ________ good at maths 2 years ago.13. They like traveling, they ______ in London thisweek?14. It ___________ Sunday today, yesterday it _________ Saturday.15. I ___________ at home, I ___________ at thegym with some friends.16. We _______ with friends yesterday, we ________ alone. 1. Bob and Sue are old now but then ______________young. 2. Bob and Sue aresad now but then __________ 3. Sue is fat now but then _____________ 4.They are often ill now but then ____________ 5. Their skin is wrinkled nowbut then ____________ 6. They are often angry now but then_____________ 7. Their hair is grey now but then ____________ 8. They are often tired nowbut then _______________ 9. Sue is forgetful now but then _____________10. Bob and Sue are rich now but then _____________ 11.They are mean now but then ______________12. Their children are adults nowbut then _____________ 13. Sue is ugly now but then ______________. 1.______________________________________?He was born in 1916.2.______________________________________?It was sunny and hot.3.______________________________________?She was bad tempered and grumpy.4.______________________________________?I was with my sister.5.______________________________________?They were at the beach last summer.6.______________________________________? When I woke up this morning, I found my dog, Fox, waiting for me. Hewanted me to take him for a walk. I was too hungry, so first I had breakfast.I had a glass of milk and a piece of toast. Then I washed my teeth and puton a track-suit and a heavy coat, because it was really cold outside. Fox wasalready impatient. We both went out, and walked to the park near home. Heran and jumped, and pursued some passers-by. He also destroyed some pieces of furniture somebody left on the road. I sat on a bench all the time,wishing I could be inside my warm bed. When my hands were frozen, Idecided it was time to go back home. Fox didn’t want to, but I pulled hardand I managed to take him back. When we arrived at the front door, Irealized I didn’t have my keys with me, so we stayed out in the cold formore than an hour! Fox was happy, but I was late for work! 1.Write all the verbs you find in the past simple tense. Which of them are regular? Which are irregular? 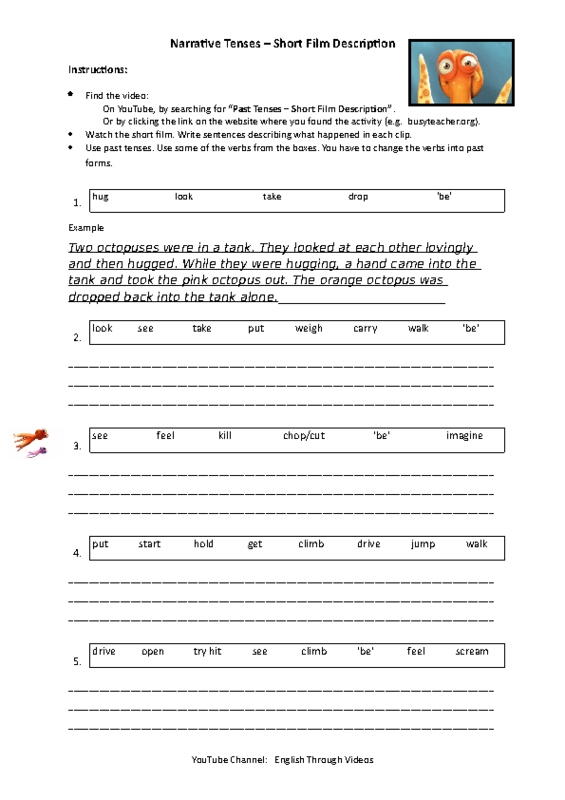 Write the infinitive of the irregular verbs. a.Who was happy to stay outside? b.What did Ben do in the park? c.What did Fox do in the park? d.What did Ben have for breakfast? e.What was the weather like?f.What was Ben wearing? g.When did Ben decide it was time to go home?